As a travel writer, I receive all sorts of emails and press releases from people who want my attention (and that of all travel writers; I’m not special). I hear often from the public relations and marketing folks who represent convention and visitors bureaus; national parks; hotels and spas; tour companies; travel agencies; cruise companies and more. Sometimes the information they offer is worth passing along; sometimes it isn’t. And sometimes their messages are the stuff that dreams are made of. The Wonders of the World by Private Jet Tour, offered by Abercrombie & Kent. It combines several “singular destinations into one extraordinary globe-spanning journey.” And you’ll have plenty of time to plan because the plane doesn’t take off until Sept. 17, 2015. Between then and Oct. 10, 50 passengers will be flown to the ancient Inca city of Machu Picchu in Peru (finish the trip to the top — 8,000 feet — via train); Easter Island in the Southeast Pacific; the Sydney Opera House (attend a private performance); the world’s largest religious monument, Angkor Wat, in Cambodia; India’s white-marble Taj Mahal; and Istanbul, Morocco and Marrakech. No dueling the other passengers for precious reclining space, either. Your private chartered jet features “fully lie-flat seats” equipped with personal massage systems, four-way adjustable headrests and lumbar supports. All this and more for $108,000 per person, double occupancy. If this seems a bit pricey, you have another option: a round-the-world cruise on one of Silversea’s boutique ships (as small as 100 passengers) for slightly more than half of the jet tour – $58,950 per person. The 115-day voyage visits 50 ports and 30 countries, and as luck would have it, it departs from Los Angeles Jan. 5. Ports of call include the Marquesas Islands; Tahiti; Bora Bora; Sydney; Bali; Hong Kong; Ho Chi Minh City; Mombasa, Kenya; Dzaoudzi (on a tiny island north of Madagascar); St. Barts; and San Juan, Puerto Rico. The voyage ends in Fort Lauderdale. If this is still a tad outside your budget, consider a cruise aboard mega-yacht SeaDream I or II, which carries 112 passengers (95 crew) to destinations such as Athens, Dubrovnik, Istanbul and Malaga. Enjoy the owner’s suite for a 12-day voyage for a mere $13,500 per person, double occupancy. If a luxury safari is on your dream list and “money is no object” (it says so on their website), Extraordinary Journeys has “authentic experiences for discerning travelers” to East and Southern Africa. Prices do not appear on the site, either, because this agency designs custom tours. And as they say, if you have to ask, you can’t afford it. • Travel by private plane; all-terrain vehicle; hot air balloon; elephant, camel or horse. Iceland is on my bucket list, so REI’s Iceland Hiking adventure for about $5,000 per person (air transportation not included) has me fantasizing. 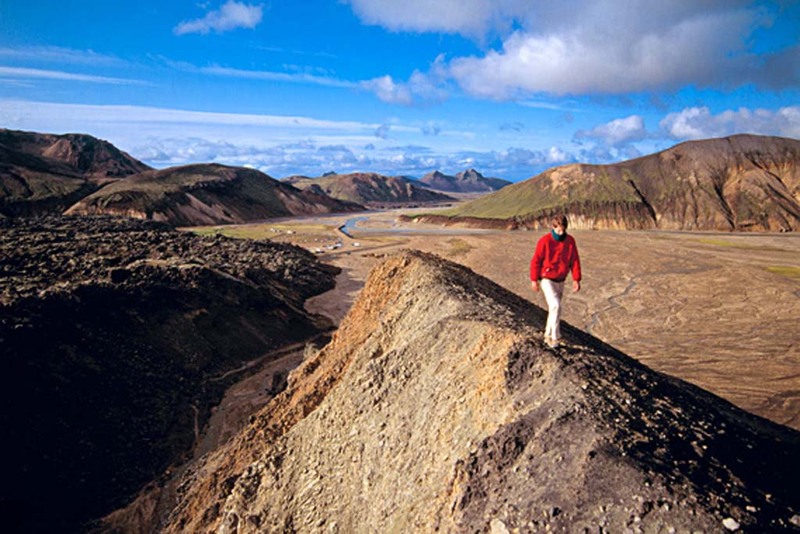 The nine-day trip (summer only) includes hiking and exploring lava fields; geysers; other-worldly rock formations; glaciers, lagoons; iceberg-filled lakes; volcanoes; and wildlife.